Durrus is a village at the head of Dunmanus bay, south of the Sheep’s Head peninsula in the southwest of Ireland. 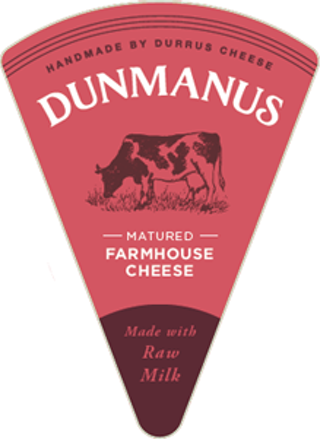 Durrus is also the name of an award-winning, semi-soft cheese, while Dunmanus is a harder cheese, aged a lot longer. Both were created by Jeffa Gill and are hand made by Jeffa and her small team up above the village and the bay. Jeffa is one of the pioneers who turned West Cork into a heaven and a haven for cheese-lovers. One of the special characteristics of Durrus and many West Cork farmhouse cheeses is that they are washed rind cheeses. The young cheese is inoculated with specific bacteria (some cheeses pick their surface moulds up from the atmosphere) and is then frequently washed or moistened with a brine solution, which gives those bacteria a boost and keeps other micro-organisms at bay. The result is what many people call a stinky cheese, although the actual flavour of these cheeses is often mild, sweet and creamy. The really remarkable thing about West Cork is how an entire food ecosystem has grown up there in the past 50 years or so, each part depending on and encouraging the others. The fact that there are so many outstanding farmhouse cheesemakers is no accident; they all gathered originally and shared their ups and downs, from which each developed their own unique cheeses. They were supported by local shops and restaurants, who created demand not just for fine cheeses but for so many other foods too. Surely someone must have documented it; so where is it? Durrus Cheese has a website. And some equally cracking stuff on washed rind cheeses, at microbialfoods and seriouseats. Dorothy Cashman liked this article on twitter.com. Suzy Chase liked this article on twitter.com. A trip to the Sheep's Head peninsula in West Cork and one of the pioneer cheesemakers there, Jeffa Gill.